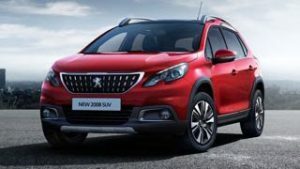 The Peugeot 2008 is a Compact Crossover based on the excellent Peugeot 208, it has an extra 20cm in length, 5cm in width and 10cm in height making for an extra 75 litres of luggage space, 360 litres, and more room for front and rear inhabitants than it appears from the outside of the car. Raised wheel arches, a big grille and roof bars add a touch of SUV about the 2008, despite it only being available as front wheel drive, but it does boast traction control, standard on the top two trims, that will help with the winter weather. The 2008 squares up well to the Vauxhall Mokka, Mini Countryman and the class leading, if a little over aggressive in design in our opinion, Nissan Juke. The Peugeot 2008 lineup are disastrously named: Access, Active, Allure, Allure Premium and GT Line, no doubt this is a french car, and like all french cars the standard level of equipment is generous, even the entry level Access you enjoy LED running lights, air conditioning, cruise control, electric front windows and electrically operated and heated door mirrors, move up to Active and you add front fog lights, 16″ alloy wheels, leather wrapped steering wheel, a 7 inch multifunction colour touchscreen with DAB radio, Mirror Screen for your smartphone and CarPlay to stream music, the Allure trim adds 17 inch alloys, parking sensors, privacy glass, all round electric windows, climate control and grip control (not on 1.2 petrol automatic). 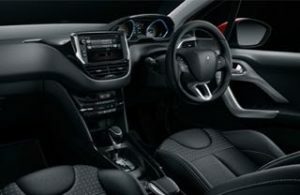 Allure Premium adds seven-inch touchscreen with satellite navigation, reversing camera and voice control functions, Peugeot CONNECT telephone assistance, panoramic glass roof with electric blind, partial leather interior, plus a leather trimmed steering wheel. The range topping GT Line adds black alloys, and GT line trimmings. The 2008 is powered by a three cylinder 1.2 litre petrol or a 1.5 diesel. The new lightweight 1.2 three cylinder option offering 82, 110 or 130bhp, the smallest is adequate for plodding around town it does suffer a little on the open road, (0-62mph in 13.5 seconds) the 110’s time is 9.6 and the wonderful 130bhp version takes 9.3 seconds with 6 gears. The best power to economy ratio is found in the 1.5 litre diesel with 100bhp or an optional 120bhp in Allure and Feline trim the 100bhp diesel engines deliver 78 miles per gallon and can reach 62mph from standstill in 11.3 seconds or 9.6 seconds with 120 horses. The Automatic gearbox is either on the 1.2 petrol or the 120 1.5 diesel both paired to a 6 speed traditional Automatic Gearbox. 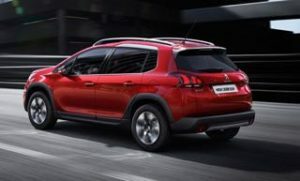 This Quarter Peugeot are adding City Brake (auto braking at under 20mph) to all models and 17 inch black alloy option to the GT Line.